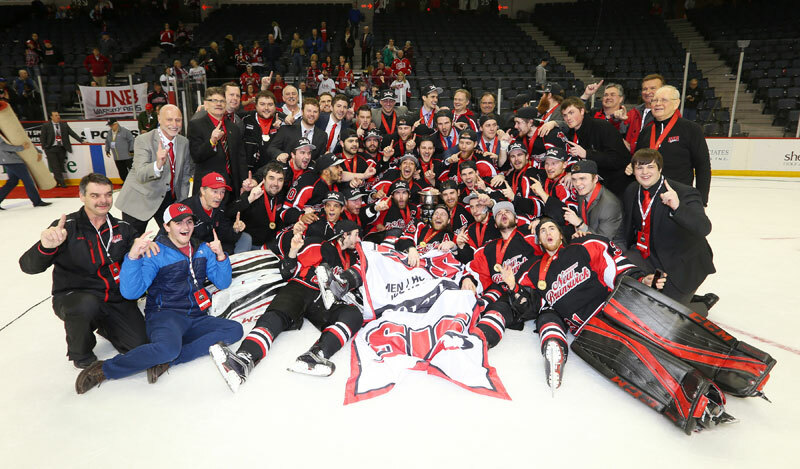 The University of New Brunswick (UNB) Varsity Reds captured the CIS University Cup crown with a 3-1 win over the rival StFX X-Men in the gold medal game Sunday night at Scotiabank Centre. Last March, on the same Halifax ice surface, UNB claimed silver medals, after dropping a decision to the Alberta Golden Bears. This season, they took that final golden step. "The whole year we didn't want to ever have that feeling again," Varsity Reds' defenseman Jordan Murray said, on the ice during the post-game celebration, about last season's defeat. "We had a little taste of it in the finals at AUS against these guys [StFX], and we knew coming in today that we weren't going to let that happen again." Earlier this month, the X-Men swept the Varsity Reds in two games for the conference crown. "We played a pretty good game tonight - only one mistake - and we came out on top," Murray added. After last season's championship game loss, UNB head coach Gardiner MacDougall talked about his young team being ahead of schedule by making it that far in the tournament. "No question - that was the expectation from Day 1," the veteran bench boss said, when asked if he believed his team would be back at this point this season. "We want to be where they are," he added, repeating a Murray quote after last season's gold medal game loss. "I think, when you have a mission statement like that, and everyone buys into it, you can accomplish a lot. It is not an easy road to get to where we are. We have a tough conference and we faced a lot of adversity this season," MacDougall said. Less than 90 seconds into the match-up, the X-Men garnered the first quality scoring chance, when Michael Clarke collected the puck in the slot at the side of the UNB net before feeding Nathan Pancel, who was alone in front, but the pass was just out of his reach. The Varsity Reds got their first opportunity, before the two-minute mark, when Dylan Willick blazed down the wing and tested X-Men goalie Drew Owsley with a hard shot, from just inside the blue-line, but the AUS second-team all-star flicked the attempt to the boards with his blocker. About one minute later, Tyler Carroll steamed down the left wing and cut through the lip of the X-Men crease, but Owsley steered away the UNB forward's backhand attempt. Before the five-minute mark, Taylor MacDougall re-directed a point shot, but Owsley was able to adjust, make the stop and smother the puck. At 6:53, Christopher Clapperton broke the scoring goose egg for UNB. After gobbling up a point shot from Murray that caromed off the boards behind the X-Men net, he dashed to the front and stuffed in a wrap-around shot. Murray and Cameron Braes notched the assists. At the midway point of the opening stanza, Murray - the CIS defenseman of the year - glided over the X-Men blue line before uncoiling a blistering shot, but Owsley deftly shot out his trapper and made the glove save. On their first power play of the game, the X-Men could not capitalize, with the best chance coming off the stick of defenseman Bronson Maschmeyer on a one-timer. Etienne Marcoux made the save and smothered the rebound, even with Pancel on his doorstep looking for a deflection or rebound opportunity. The X-Men almost tied it off a lucky bounce, when a Clarke shot hit a leg and ended up on the blade of AUS MVP Eric Locke on the face-off dot, but Marcoux darted across his crease to rob the CIS first-team all-Canadian with his left pad. While shorthanded, the Varsity Reds broke in 2-on-1, but Owsley made a blocker save on Rob Mignardi. With 11 seconds remaining in the opening stanza, the X-Men notched the equalizer when Zack MacQueen tipped in a point shot from defenseman Nathan Chiarlitti. Cory MacIntosh chipped in the other assist. "We gave up one at the end of the second period against Alberta, even though we were within 4-3 with four minutes left it really took a lot out of us to give up that late goal," MacDougall said. "I think the guys - with that one year maturity - when we gave up that late goal today, they really responded well, I thought, in our second period." The Varsity Reds outshot the X-Men 14-10 in the first period. In the opening minutes of the second period, the teams exchanged chances, but the goaltenders and defenses held the fort. With a pair of goals 17 seconds apart midway through the middle frame, the Varsity Reds jumped to a two-goal edge. At 9:02, on the power play, Francis Beauvillier took a shot from just inside the blue line, kept his skates going and eluded an X-Men defender, before grabbing his own rebound and putting it behind Owsley. Randy Gazzola and Philippe Halley collected the assists. After the next face-off, the Varsity Reds regained the offensive zone, with Carroll picking up the puck at the side of the net and stuffing a backhander behind Owsley, at 9:19, to make it 3-1. Dylan Willick and Matt Boudens set up the tally. While the X-Men were on the power play later in the period, tournament-leading scorer Halley broke in alone, but Owsley got a piece of the sniper's back-hand attempt and deflected it wide. In the second period, the Varsity Reds had 11 shots, while the X-Men collected six. In the third period, on an early man advantage, StFX could not muster up much of an attack, with the best chance coming in the closing seconds, but Holden Cook ripped a sizzling shot wide behind Marcoux. With UNB playing tight defense, up two goals, the X-Men were having difficulty generating offense. In one spurt midway through the third period, a centering pass bounced over the stick of Locke, while his shot attempt a few seconds later hit a defender's leg in front of Marcoux. A late penalty with less than five minutes left in regulation time also hampered the StFX rally. With less than three minutes left, Marcoux preserved the two-goal UNB margin with a glove save on Locke. With two minutes left, the X-Men pulled Owsley for an extra attacker, but they could not carve into the lead. When the buzzer sounded, the Varsity Reds swarmed Marcoux, savouring their national championship win. MacDougall, with a laugh, said "only giving up one goal, and we were disappointed in that," when asked for a key to the victory. "That's been a big thing for us all year is that we have got to win every third period," Murray said, when asked of UNB's effort in the final 20 minutes of the semi-final and championship games, where they held Saint Mary's and StFX scoreless, as each attempted rallies. "We pride ourselves on that - our conditioning and everything - and it paid off here. We are national champs," he said, with a wide smile. MacDougall described the third-period shutdowns as "part of the group doing it better than it has ever been done." "A lot of times, in the past, we would maybe score two or three in the third, and give up one. With this group, we haven't scored as many in the third, but we haven't given up very many, since Christmas, in the third, which is a credit to the group," he said. Marcoux made 22 saves for the win, while Owsley turned aside 27 shots in the loss. Clapperton was named player of the game for UNB, while Locke earned the honour for StFX. "It is a game that - we didn't get the result that we wanted, of course, but they [UNB] played well," X-Men head coach Brad Peddle said. "I thought there were times where it looked like we were going to get that second goal." Peddle called it "a tight-checking game." "A 3-1 game in a national final - it's close, like people expected, but obviously not the result that we wanted," he said. "But, at the end of the day, it's two good teams going at it again. "We are very familiar with each other but, obviously, we respect the fact that they are a good team - and we are a good team," Peddle added. The CIS coach of the year described his players as "an unbelievable group to coach." "The high-character, resilient group that brought a winning tradition back to X, and put them on the national stage again," Peddle said. "It is something that we are certainly going to build off of in our program, but certainly we are going to have to see some really good players and great people leave our program that showed young guys the way this year. "It stings right now, but I couldn't be more proud of this group, and everything they have shown all year. It might not seem like it today, but they certainly are champions," he added. With the Saint Mary's Huskies capturing the bronze medal earlier in the day, the AUS swept the top-three spots in the tournament, which has not been accomplished since the same conference did it in 2004, with StFX (gold), UNB (silver) and Dalhousie (bronze) reaching the medal podium. "It's pretty special for the AUS," MacDougall said, when asked about the league's accomplishment. Halley garnered the Major W.J. 'Danny' McLeod Award for CIS University Cup MVP. Joining him on the tournament all-star team were forwards Anthony Repaci (Saint Mary's) and Michael Clarke (StFX), along with defensemen Nathan Chiarlitti (StFX) and Jordan Murray (UNB), and Jordon Cooke (Saskatchewan) getting the goaltending nod. "It feels good, but the most important thing is that we are champions right now," Halley said, when asked about his MVP performance. The third-year forward from Quebec City, Quebec, scored a tournament-high six goals. "I knew we were ready for this game; they beat us in the AUS final, and we didn't forget that," Halley said. "We played a great game - a team effort, like we did all tournament, and it paid off. We have the Cup right now." The four-day 2016 CIS University Cup set attendance records, attracting 43,513 fans, including 9,873 for the gold medal game. With files from Canadian Interuniveristy Sport.